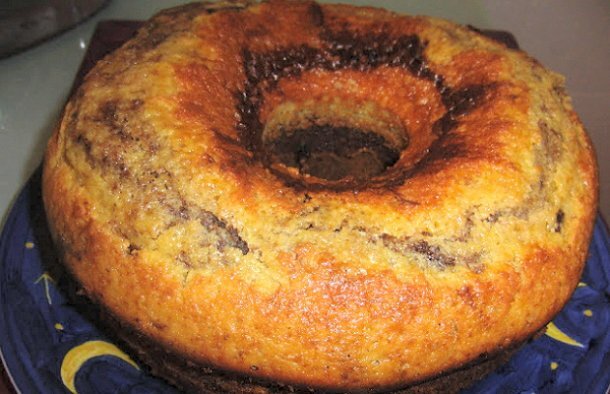 This rich and buttery Portuguese cocoa marble cake recipe (receita de bolo mármore) contains chunks of chocolate as well. Beat the butter well with the sugar until it's smooth. Then add the eggs, one by one stirring between each addition. Sift the flour with the baking powder and add it to the mixture. Finally, add the orange juice and beat well until a homogeneous batter is obtained. Remove 1/3 of the dough, add the cocoa powder to it and mix well. In a greased form, place the white batter. Add some chocolate chunks on top. Finally, add the batter with the cocoa powder on top, stick in a spoon handle all the way to the bottom, and slide it from side to side a few times to mix/blend in the cocoa batter a little with the white batter. Bake at 190ºC or 375ºF for about 30 minutes. 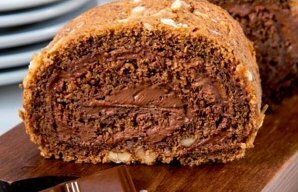 This Portuguese coffee and walnut tart recipe (receita de torta de café e nozes) is delicious and has a very unique taste. 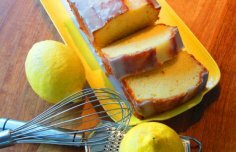 If you like your cake moist, this delicious Portuguese moist coconut cake recipe (receita de bolo húmido de coco) will create a cake to your liking.